Building Forward: Higher standards for human experiences. We’re building Boston’s legacy, today and every day, because we have a vision of the city’s future. Cronin Development crafts buildings, human experiences and shapes vibrant neighborhoods. Aspirational thinking and meticulous attention to detail suffuse our entire process. From design to partnerships to execution to community development, we’re committed to imagining and delivering the best products on the market. Combining investment rigor, discipline, and efficiency, Cronin Development is moving the needle toward a higher caliber of excellence. With the help of our partners, we’re transforming design thinking into rich and rewarding results for residents, investors, and the broader Boston community. 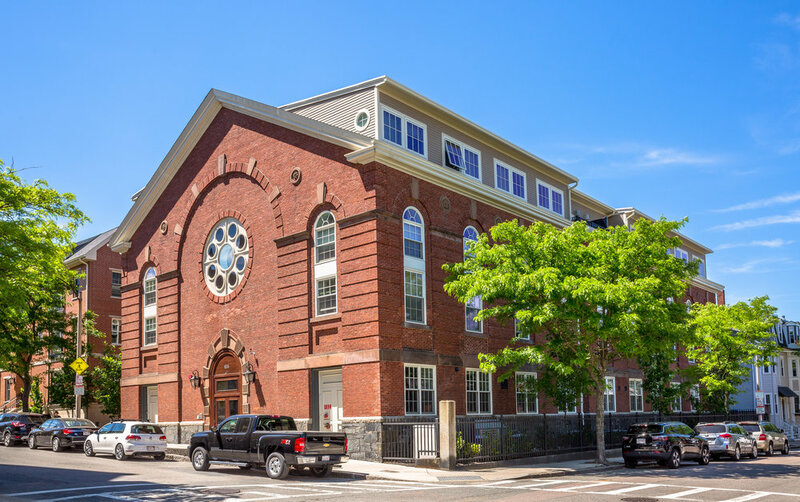 Founded in 1995 in South Boston, Cronin Development is driven by a sustained dedication to world-class design, and a community-oriented outlook. With two decades of development success under the leadership of Principal Jon Cronin — entitling, financing, and developing — we remain entrepreneurial, disciplined, and steadfast in our mission to develop leading human experiences. A sharp, agile approach to development. Our company’s holistic approach considers each development opportunity and provides a tailored evaluation and a specially selected team to guarantee success. 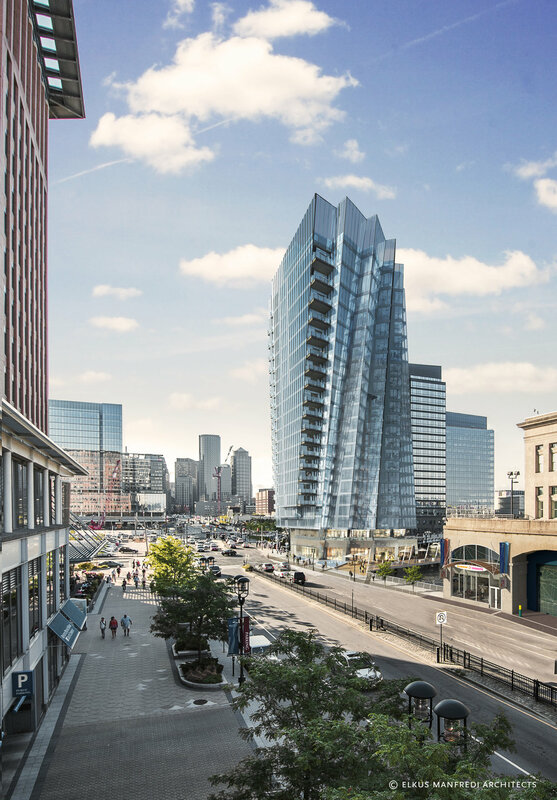 With 114 units spread over 22 stories, 150 Seaport is set to become the city’s premier residential tower. Designed by architects Elkus Manfredi, it will be the only building of its kind in Boston with private balcony space for every resident. That means every single residence offers sweeping views of Boston or Boston Harbor. This one-of-a-kind structure will impress the city around it. Its six glass sails rise 250 feet and fan outward toward the water, calling to mind the masts and sails of ships in the surrounding harbor. 150 Seaport bridges the space between waterfront and urban space with ground-floor retail and restaurant options, including an extension of the existing Harborwalk. An historic rehabilitation of the original Gate of Heaven Church to 24 units of residential living with 23 underground parking spaces. A new 14-unit condominium development consisting of 12 market rate and 2 affordable condominiums, as well as 26 underground parking spaces. 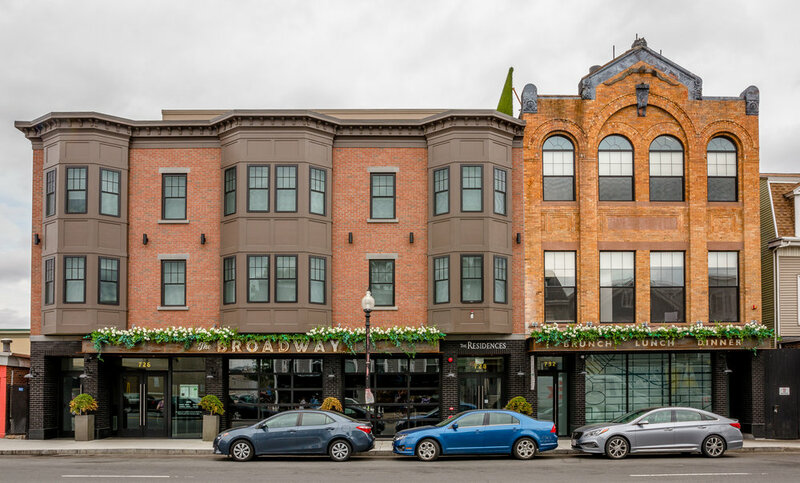 Four-story mixed-use building located on East Broadway in the heart of South Boston. 728 East Broadway features 18 condominium residences, 6,400 square feet of ground-floor retail space and an underground parking garage containing 34 parking spaces. combined experience in real estate success. 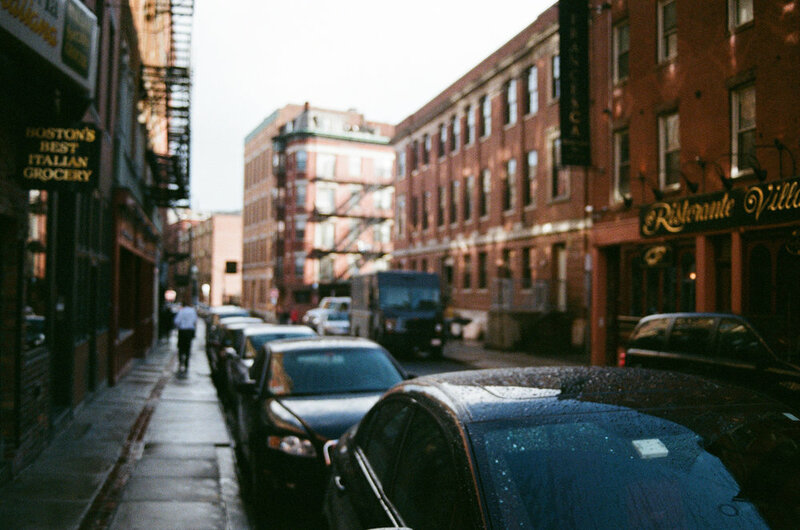 Originally from County Cork, Ireland, Jon has lived and developed real estate in Boston for more than twenty years. Before founding The Cronin Group and Cronin Development, Jon worked out of the Charlestown offices of the engineering design and construction company Metcalf and Eddy as a Project Manager. In his time there, he helped to manage the Boston Harbor Project, considered one of the nation’s greatest environmental achievements. Actively involved in several Boston-area nonprofits, Jon is the Vice President of the board at the South Boston Collaborative Center and sits on the Board of Directors of the South Boston Neighborhood House. Along with his wife Nicole, two daughters and son, he lives in the Seaport district of Boston. Sean joined Cronin Development in 2018 and is responsible for oversight over the Company’s development management activities, financial operations, and underwriting of new investment opportunities. Prior to joining Cronin, he was a Director at Rockbridge Capital, a hospitality-focused private equity firm, where he supported the investment team in originating, underwriting, and structuring new debt and equity investments in hotel properties. Before Rockbridge, Sean was an Associate in J.P. Morgan’s real estate, gaming, and lodging investment banking group, where he worked on a variety of advisory and corporate finance transactions. Sean received a Bachelor of Arts degree from Williams College and an MBA from the Kellogg School of Management. He is an active member of NAIOP and REFA. Sean is a dual citizen of the U.S. and Ireland, and currently lives in Charlestown with his wife, Amanda. Involved in and responsible for various capacities of the marketing and sales of over 2,000 new & conversion condominium units in multiple developments, he has been a part of successfully completed sales programs at Boston’s most desirable buildings, including most recently Millennium Partners’ Millennium Tower Boston as well as The Abbey Group’s, 45 Province. Previously, Wayne was a principal of RESIS as well as The Marketing Group, in addition to managing director for Onsite Sales and Marketing at Otis & Ahearn. Wayne earned his Master’s in Business Administration at Bentley College, Bachelor of Science in Economics and Management Science at SUNY College at Cortland. Wayne currently resides in Boston with his fiancée Elena and their son, Nikola. Cathy brings over 20 years of luxury residential sales and marketing experience to The St. Regis Residences, Boston. Cathy has achieved record breaking sales with top developers in the Boston market including The Fallon Company, Draper and Kramer and the Related Companies including prestigious projects like Twenty-two Liberty, 50 Liberty an The Clarendon. Prior to entering the real estate market, Cathy was a Regional VP for Eastman Kodak Company. Cathy earned her Bachelor’s degree at the College of Holy Cross in Political Science. Cathy currently resides in Boston. Laurel oversees all aspects of marketing, public relations and business development for Cronin Development bringing 25+ of commercial real estate experience for diverse mixed-use projects. She has a proven track record for creative visioning, brand strategy and business development with the ability to think strategically and motivate teams around common goals while ensuring execution excellence. Prior to joining Cronin, Laurel was the CMO of Arrowstreet Architecture and Design and held a variety of senior executive positions for WS Development, Tanger Outlets and Simon Property Group where she led the marketing for mixed-use retail developments across the country. Laurel holds a Bachelor’s degree in Communications / Psychology from Bridgewater State University and recently earned her ICSC Certified Retail Real Estate Professional Designation (CRRP). Laurel currently resides on the South Shore and has two sons. Donna has over 25 years of real estate development and project management experience on a wide range of urban mix-use projects including institutional, educational and residential development. Her expertise includes master planning, development management, regulatory permitting and managing design and construction activities. Prior to joining the Cronin, Donna was a Vice President at Hill International where she was responsible for major development projects. Her clients include Simon Property Group, Northeastern University, Boston Medical Center, Steward Healthcare, University of Massachusetts Building Authority and various local municipalities. Donna lives in Westwood with her husband Andy and has two children. Abbey brings extensive experience in all phases of multi-family residential and commercial developments, from design through construction administration. Since joining Cronin Development in early 2017 Abbey has overseen the construction of retail and restaurant developments throughout greater Boston, including Temazcal Tequila Cantina, Jack’s Coal Fired Pizza, and Tony C’s Sports Bar. She also provides project management for various projects with Cronin Development including The St. Regis Residences, Boston. Abbey holds a Master’s Degree in Architecture, from The University of Michigan, and is a licensed architect in Massachusetts. Prior to joining Cronin Development, she was a Senior Associate at Neshamkin French Architects, in Charlestown, MA. Anand Boscha joined Cronin Development after graduating from the Yale School of Management with a Master’s in Business Administration. He is responsible for day-to-day oversight of financial matters, including tracking and projecting expenses, invoices, sales, and project returns. Previously, Anand was a civil engineering project manager, supervising multimillion dollar site investigations for new nuclear power facilities both domestic and overseas. Besides his M.B.A., Anand holds B.S. and M.S. degrees in Civil Engineering from Carnegie Mellon University and a Masters of Engineering Management from Dartmouth. Originally from Pittsburgh. Anand lives in Boston with his fiancée Brighid. Prior to joining Cronin Development, Ashi worked as the Sales Coordinator at the Fallon Company on prestigious projects such as 22 Liberty and 50 Liberty. She was responsible for establishing and maintaining positive client relationships, scheduling appointments, fielding calls and assisting in the execution of purchase and sales agreements. She also contributed to the creation and production of marketing materials and advertising campaigns for the 50 Liberty project. A large part of her role included the preparation of sales and marketing reports by collecting, analyzing, and summarizing sales data on a weekly basis. Ashi holds a Bachelor of Arts Degree in Political Science and minor in Sociology from University of Hartford and is a Member of the Signa Alpha Pi Honor Society at University of Hartford. Ashi grew up in Cambridge, MA and currently lives there.